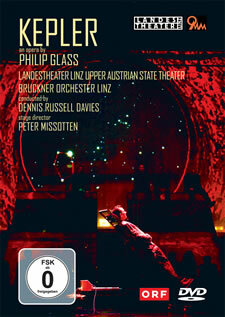 Kepler, composed by Philip Glass for the Upper Austrian State Theater and “Linz09” (European Capital of Culture) deals with the intellectual cosmos of the great astronomer Johannes Kepler who was teacher of mathematics in Linz from 1612 to 1627, during which time he developed his ground-breaking laws of celestial movement. The opera is not concerned with biographical details, but deals instead with the fundamental questions that Kepler was obsessed with, and which he hoped scientific principles would help answer. ï¿½Social and political upheaval in the wake of the Counter Reformation shaped the world in which Kepler, surrounded on all sides by war and religious strife, doggedly sought a divine order, which he was certain could be found in nature. “God has based everything on numbers” was the motto that stimulated his research. Philip Glass was particularly inspired by Kepler’s conviction “without real knowledge life is dead.” ï¿½Austrian librettist Martina Winkel has based her text on original words in German and Latin by Kepler, with additional relevant passages by the Baroque poet Andreas Gryphius and a short excerpt from the Old Testament Book of Genesis. The original Linz stage production was conceived and directed by Belgian video artist Peter Missotten. Fragments from the life and ideas of the scientist Johannes Kepler are contrasted with segments from the story of creation and poems by Andreas Gryphius, which portray Europe during the Thirty Years War. Following a Prologue with the text from Kepler’s own draft of an epitaph for his grave, Act 1 presents a sequence of Kepler’s texts showing him as a scientist: his curiosity about the divine blueprint for the world and the planetary system: “What is the World?”; his conception of the planetary system as a sequence of nested polyhedrons, along which the orbits of the planets. Kepler is convinced that he is praising God with his astronomical research. In the text of the biblical story of creation, he repeatedly interjects his conviction that the bible is not to be misunderstood as a source of scientific insight. Kepler explains his scientific method and his intention of seeking to establish astronomy following the example of recognized sciences. He is convinced that heaven is not a place inhabited by “divine beings”, but rather a “clockwork” that can be scientifically explained. Kepler is certain that God created the human soul to enable scientific insight. In Act 2 the man behind the scientist comes into view. Kepler partly earned his living as an astrologist. He also prepared astrological calculations for himself (“I have calculated the date of my conception”). Among his records there is a pitiless self-portrait (“This man has completely the nature of a dog”). A list of his enemies that Kepler drew up seems to have no end. But Kepler does not only blame others for this. Despite all this, Kepler seems not to have afforded astrology any high status. Gryphius: An die Sternen/To the Stars Systematic reflections bring Kepler to the idea that the planets do not move, as previously thought, in circular orbits through space, but rather along orbits in the form of “perfect ellipses” that evoke an inaudible “celestial music”. Kepler recognizes God in this wonderful creation of the sky and prays to him. The raging destruction of the Thirty Years War becomes a threat to all mankind. Kepler knows there is no longer any secure refuge for him. All that is left to him is to return to his “peaceful studies”. The Epilogue closes the circle with the text of the epitaph. Sung in German and Latin with English and German subtitles.